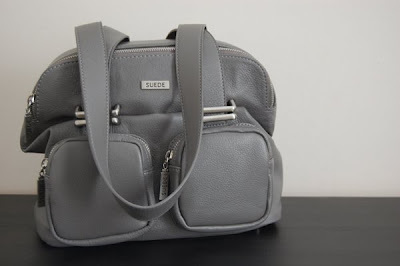 New bag: Banshee, by Suede & Co. Ample and lovely and grey. Grey is currently my favourite colour. 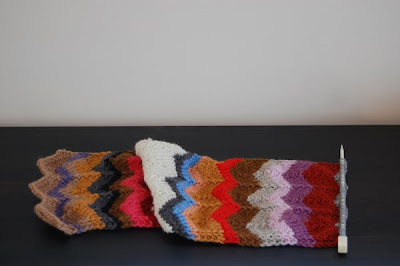 New Scarf-in-Progress: Basic chevron pattern + random bits = Scrappy Scarfy. I still haven't decided if I'm going to keep him or if he's going to take up residence in my Etsy shop. Now I'm off to invent French toast popovers. I love Soul Music. Have you seen the cartoon? January 21, 2010 at 2:18 p.m.
Oh to that purse! I love grey, too! January 21, 2010 at 5:09 p.m.
Nice bag and nice scarf!! January 21, 2010 at 6:33 p.m.
hooray for Terry Pratchett! My favorite is Guards, Guards! January 23, 2010 at 12:07 p.m.
Agreed- grey is the BEST color. I always point out that there's an ugly shade of purple, red, green, and brown- but there is no ugly shade of grey. The coziest and most versatile and most beautiful color there is. February 25, 2010 at 3:35 p.m.